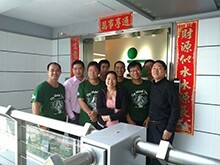 Indium Corporation recently relocated its Shenzhen office to a larger facility at, West Tower, Qiushi Center, Room 1701, Zhuzlin, ShenNan Road Central, Futian District, Shenzhen, PRC. The move addresses the sales team’s need for additional space due to increased staffing. In addition, the new location provides room for increased product inventory and supplies, while also serving as a more convenient location for employees and visitors.